The man who became famous for his antivirus computer software is wanted for questioning in connection to a murder in Belize. Julie Noce reports. SUCCESSFUL Silicon Valley entrepreneur John McAfee says he buried himself in sand with a cardboard box over his head to hide from police. Mr McAfee, founder of the eponymous anti-virus company, is being sought for questioning in connection with the killing of another expatriate US citizen, Gregory Faull, in the Central American nation of Belize. Police raided Mr McAfee's mansion on Ambergris Caye, an island off the northeastern coast of Belize, late on Sunday to question him about the murder of Faull. But McAfee was nowhere to be found. "It was extraordinarily uncomfortable," he told Davis. "But they will kill me if they find me." Asked about the shooting of his neighbour, Mr McAfee said he knew "nothing" other than he had been shot. The anti-virus pioneer even said he was worried that Faull's killers had actually been looking for him. John McAfee apparently buried himself in sand and stuck a cardboard box over his head so that police wouldn't take him in for questioning in the case of his murdered neighbour. "Under no circumstances am I going to willingly talk to the police in this country," he said. "You can say I'm paranoid about it but they will kill me, there is no question. They've been trying to get me for months. They want to silence me. I am not well liked by the prime minister. I am just a thorn in everybody's side." 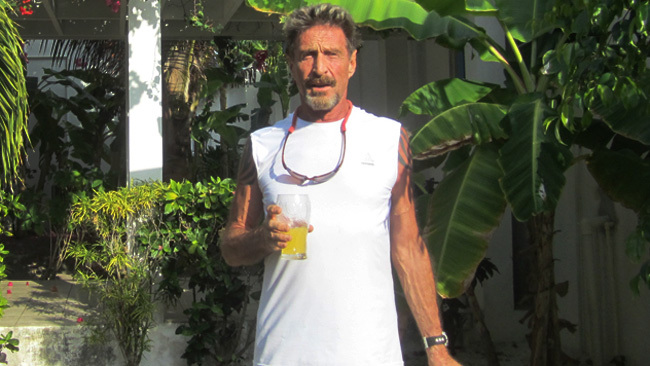 Mr McAfee has been living in Belize, a former British colony, for the past four years. Faull was found with a gunshot wound to his head inside his two-story home north of San Pedro, said Raphael Martinez, spokesman for Belize's Ministry of National Security. The housekeeper discovered the body on Sunday morning and called police. Mr Martinez pleaded with Mr McAfee to come in for questioning. John McAfee is wanted by Belize police for questioning in relation to the murder of a United States expatriate in San Pedro Town. "We want to encourage him to come in," he said. "If he feels threatened, we need to tell him, 'Get someone to go along with you, but come in. Let's solve this crime and you can free yourself.'" Residents said Faull was a longtime home owner there who had recently retired as a builder and moved from Florida to live full-time on the island. Mr Martinez said that no charges had been filed in the case. Belize police said Tuesday that Mr McAfee, 67, remains a "person of interest" in the death of Faull, not a suspect, and that he is being sought for routine questioning. They believe he is still in Belize, but they have also contacted authorities in Mexico and Guatemala, which border Belize, for help in locating Mr McAfee. The case marks the latest twist in the story of Mr McAfee, who is considered one of the pioneers of the anti-virus software industry from which he dropped out two decades ago. Jeff Wise, a science and adventure writer who has known McAfee for years, called the 67-year-old entrepreneur "an inveterate self-promoter who built an improbable web security empire on the principles of trust and reliability," and then "gave himself over to the life of a wealthy adventure seeker." "He raced ATVs (crashing a dozen or so) and made open-ocean crossings by Jet Ski (often they sunk en route)," Wise wrote on the technology news website Gizmodo. "He poured millions into a 280-acre yoga retreat in the mountains above Woodland, Colorado, where every Sunday morning he would hold complimentary classes." Wise, who has interviewed Mr McAfee at the entrepreneur's New Mexico ranch and in Belize, said Mr McAfee had been exhibiting odd behaviour and had become estranged from the US expatriate community in Belize. "I'd become convinced he was a compulsive liar if not an outright psychopath, albeit one whose life as a thrill-seeking serial entrepreneur was as entertaining for me to follow as it was amusing for him to perform," he wrote. 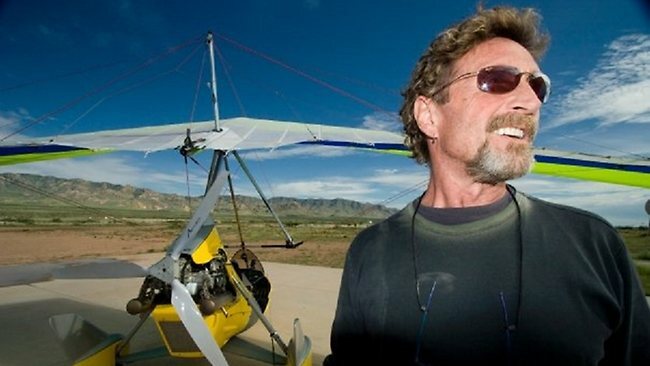 According to Wise, Mr McAfee launched a series of enterprises in Belize, including a coffee shop and a high-speed ferry service before meeting a vacationing Harvard biologist, Allison Adonizio, three decades his junior. She moved to Belize, where Mr McAfee built a lab for trials on the use of rainforest plants to fight infections in a new field of microbiology called "anti-quorum sensing." Later, they switched to a new herb which they claimed "boosted female libido," according to Wise, who said Mr McAfee and Ms Adonizio later had a falling out. The 67-year-old made millions when he sold his stake in his anti-virus software company in the early 1990s. The McAfee company is now a subsidiary of Intel Corp.